Online poker is a fun game to play causally with friends, and also a great way to make some money on the side if you take your strategy a bit more seriously. But sometimes it gets boring playing the same old forms of poker over and over again. Here we’ll discuss a more unusual form: pineapple poker. We’ll explain what it is, and how you can play it best. Pineapple poker is similar to the most common variant of poker, Texas Hold Em. However, whereas in Texas Hold Em each player is dealt two cards at the start of the round, three cards are dealt to each player in pineapple poker. It is this special third card that makes pineapple poker so different from every other poker variant. The game is played at a normal poker table with a standard set of 52 playing cards. To win, you need to make the highest scoring poker hand out of one or two of the “hole cards” and three or four of the “community cards”. At first, the dealer gives three face down cards to each player. These are known as the “pocket cards”. The players then look at their pocket cards, being careful to conceal them from each other. The player to the left of the dealer is responsible for the big blind at the start, and plays first in the starting round. Betting continues around the table until everyone has made all of their permitted decisions to raise, meet or fold. Each player is only allowed to make four bets per round. After the first round of betting, the dealer places three cards face up in the middle of the table. These are the community cards and can be used by anyone. A second round of betting proceeds around the table until everyone had made all the moves they are willing and allowed to commit. It is after this second round of betting that we reach the twist that makes pineapple poker so different: every player is now required to discard one of their pocket cards. After every player has discarded their least valued pocket card, the dealer places one final face up community card in the middle of the table. A third round of betting occurs, with the betting limit raised. The dealer places one final face up card on the table for everyone to use. The final round of betting, or “showdown”, then proceeds, so long as more than one person remains in play. After all bets have been made in the final round, players must reveal their pocket cards to find out who has won. In crazy pineapple, players discard their third unwanted pocket card after the flop (when the initial three community cards are dealt) rather than beforehand as you do with simple pineapple. In lazy pineapple, there is no third card discard, and all players instead hold onto all three cards until the end of the game. However, players are still only allowed to use one or two of their pocket cards when constructing a winning hand. In Super Hold Em, technically a variant of Texas Hold Em but similar to pineapple poker, players keep all three of their poke to cards right up until the end and are allowed to use all three of those pocket cards to form their winning hand if they so choose. Strategy in pineapple poker is pretty similar to in Texas Hold Em. 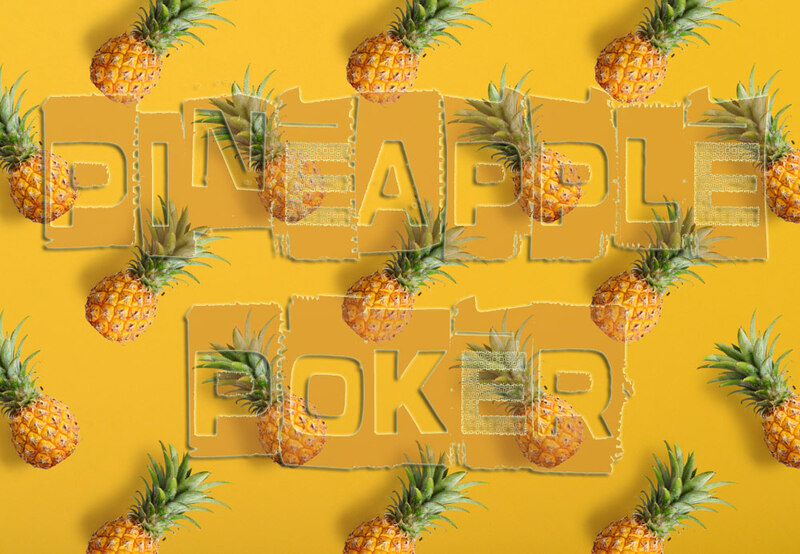 The average winning hand in pineapple poker is stronger than in Hold Em, so you need to be more selective than usual about which hands you play and which you fold. Another way of saying this is that you need to “tighten up”. Tight strategies are generally the most successful in poker, and the more cards are initially dealt, the tighter you need to be. Tight playing takes a lot of nerve, so pineapple is not for the extremely ebullient or faint of heart. Bear in mind that sets and full houses will occur more frequently in this form of poker because the presence of the three pocket cards means each player is more likely to get dealt a pair at the beginning. Two aces and King-Queen will serve you less well in this form of poker than in Texas Hold Em, so don’t be as scared to fold or discard those hands. Good luck!